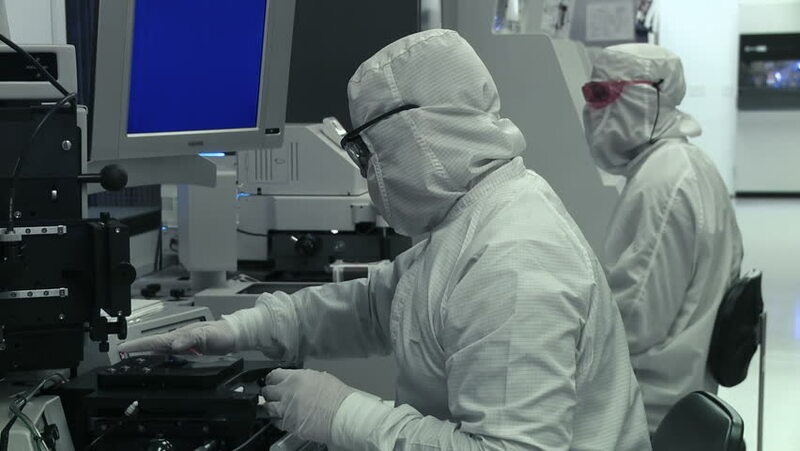 Two technicians working on silicon chip manufacture in a clean room, wearing full body white "bunny suit" coveralls to avoid contamination. Mid shot, locked off. 4k00:10Veterinary with electrocoagulator make surgery for dog in the operating room of a veterinary clinic. Vets doing surgery in the clinic. Medicine, pet, animals, health care and people concept. 4k00:194K Science Lab and scientists working on cosmetics, medicines and food analysis. Pharmaceutical industry business in production of medical products. 4k00:16Portrait of surgeons in protective gown, mask, cap and gloves washing hands before surgical operation at washroom in front of operating theater, steadicam, motion to wide angle view, concept surgery. hd00:40 Surgeons team performing operation in hospital operating theater.Surgeon operate patient, hip replacement,nurse adding surgery instruments to surgeon,working with surgical tools,operation scene. hd00:27Technician checking a photographic process while working on silicon chip manufacture in a clean room.